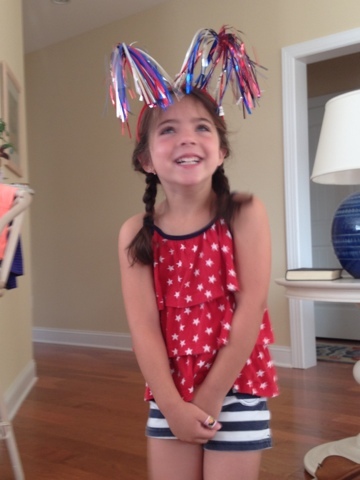 Happy Birthday, USA! 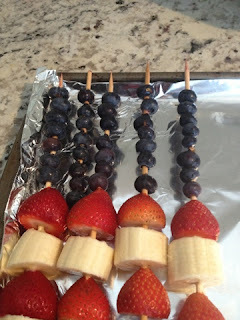 You know how to get your kids to eat their fruits and veggies? 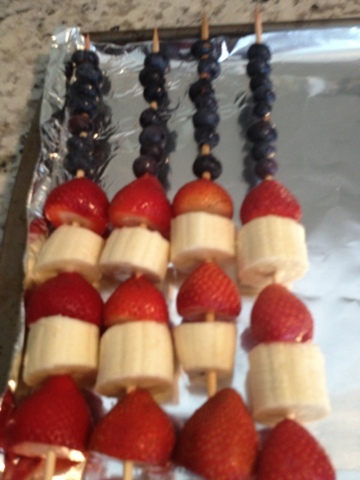 Put 'em on a stick...oh, and in the shape of a flag! Check out these adorable American Flag fruit kabobs I made today (in about 15 minutes) for a July 4th picnic we're going to. They're pretty straight forward, but I do have a few tips. Line a baking sheet with foil. You'll be working from the bottom up, so put your strawberries and bananas on first for the skewers that will also have blueberries. 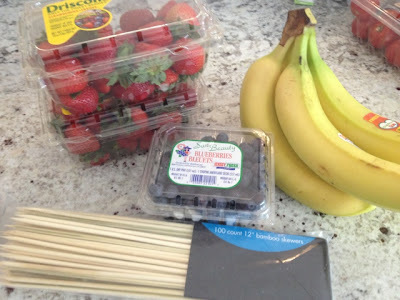 I found that three strawberries (mine were kind of large) and 2 pieces of banana came about half way up the skewer. Then I added 7 or 8 blueberries. I made four this way...but probably could have made at least one more. 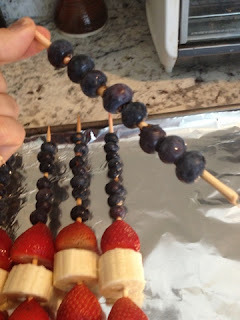 To get rid of the gap between the blueberries, I cut three skewers in half. I loaded blueberries on the halves that had the pointy end..the other half I threw out. I stuck these half kabobs in between to fill in the gaps. Then I finished up by making the rest of the skewers with 5 strawberries and four bananas each. If you keep the same pattern, they should line up pretty well. You may need to adjust the fruit a little bit if some pieces are larger than others. Now, serve it up and be impressed with yourself for serving something so healthy that looks so yummy...and festive! The kids are all decked out in red, white, and blue. I can't help it -I get one day of the year for this. 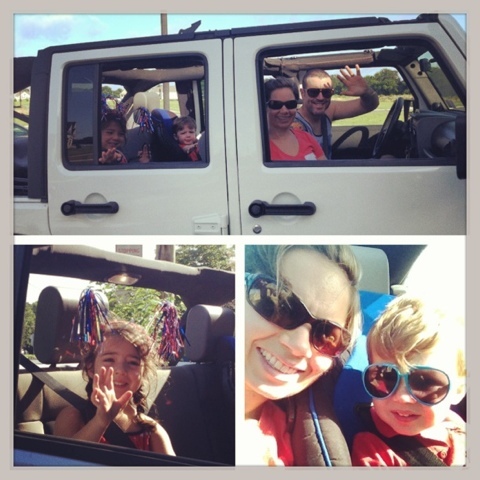 We started off with our whole family's first top-down joy ride in our new Wrangler! So fun! The kids took a bike ride with the grandparents, while we packed up for the beach. We spent a few fun hours on the beach and now my whole crew is napping before a family picnic. Perfect weather (finally) and a perfect day to celebrate the good ol' USA.